Scrap metal recycling is a good way to get rid of unwanted things and earn money in return. Here are some hacks that will make your scrap metal recycling process easier and lucrative. Our team at Lucky Group dealing with scrap metals in Doha recommends that having a magnet is useful while collecting scrap metal. This is especially important when you have undertaken the task of separating your scrap metals before taking the pile to the scrap yard. A magnet is of great help when you are not sure about the category of the scrap metal - whether it is a ferrous metal like steel or a non-ferrous one like aluminum. In such scenarios, use a magnet. The metals that cling on to the magnet (like steel) fall in the ferrous pile while the metals that don’t go into the non-ferrous pile which includes metals like brass, copper and aluminum. Why is it recommended to separate ferrous and non-ferrous scrap metals? When you do not separate ferrous metals from the non-ferrous ones, the scrap yard will weigh your scrap metal pile as a whole. This will get you less money as it degrades the price of your scrap metal pile when weighed and calculated as a whole. However, when you separate the ferrous scrap metal pile from the non-ferrous one, you get more money. It is because non-ferrous metals are more valuable than the ferrous metals. When they are both in one pile, it will naturally eat into your returns. Whenever one thinks to recycle, his or her mind apparently goes to bottles of plastic or containers. Newspapers are also a part many people’s recycling stack. But have you ever considered recycling metal scrap? Did you know how much more value or return recycling scrap metal can provide than plastic, paper or glass? If not then read on, and start acquiring and recycling scrap metal from today! Where do you find scrap metal? Scrap metal is often thrown away in dust bins that ultimately land up in big dumping grounds or pits which can be otherwise recycled. Metal scrap items like titanium, iron and copper can be easily recycled for cash at various local scrap yards. 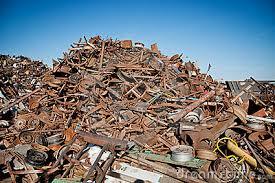 Many scrap yards source their metal scrap in huge quantities from trade verticals or industries. 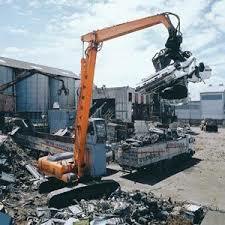 However, individuals can recycle their scrap metal pile at these scrap yards and earn good money. Ensure you separate the metal by type from the heap. It is important, considering each metal type (from silver to copper) is individually weighed and paid (as per the metal type’s current value). Hence, separating metal by type and then recycling at the scrap yard helps you to get the optimal value for your scrap metal. We are a renowned metal scrap company in Dubai dealing in recycling of ferrous and non-ferrous metals. What is trash to one person can be treasure for another, and nothing justifies this better than the idea of scrap metal recycling. This is especially true for companies that generate tons of useless metal worth thousands of dollars. However, they earn nothing when they throw all the trash away. Scrap metal recycling is a great opportunity to clear all your trash out from every nook and corner of your house, garage, office and so on. Now, collecting trash may sound not too appealing. However, the value you can get from this trash of metal is convincing enough. Also, prices of metals show a rising trend and scrap metal recycling is the perfect way to get good returns when any of the metal becomes useless. Know where you can get scrap metal in abundance and what’s the idea price you should get for a particular type of scrap. Combine this knowledge and use it to earn some good easy cash. Moreover, you help in environment preservation by preventing degradation due to metals being dumped in the ground. This causes the earth to lose its fertility and creates repercussions like soil erosion. Lucky Group is a renowned company dealing in scrap metals in Doha. Contact us to get optimal rates for your scrap metals. Millions of tons of scrap metals are put to use for various purposes globally. Both ferrous and non-ferrous scrap metals are used for various industrial purposes, some of which are mentioned in this blog. Iron scrap metal is further recycled to deliver to industries that use it to construct roads, bridges, and so on. Iron scrap is also used to manufacture automobiles, aircrafts and other modes of transport. Iron scrap metal is preferred as it is cost effective and helps preserve natural resources of the earth. Iron scrap metal is also used to detoxify industrial wastewater that is otherwise polluted with harmful chemicals. This discovery of using scrap metals in water purification is a breakthrough in the process of enabling more and more people to get access to clean drinking water. The abundant availability of scrap metals and increasing awareness among people to recycle scrap metals regularly enhances the prospects of clean water availability by turning polluted water into clean water. Another great advantage of iron scrap is that it is used to produce several useful materials for industries like food manufacturing, some of which include production of tins and cans using iron scrap. The increasing trend of scrap metal recycling has reduced the need to mine the already diminishing natural resources of the earth. We deal with ferrous and Non-Ferrous Scrap Dubai. Contact us to get optimal rates for your scrap metals. How Are Scrap Metal Prices Decided? People around the world are realising the returns scrap metal recycling gives to the seller of metal scrap. Do you have copper wires, cans, aluminium components and other similar junk at home? It’s time you approach a nearby scrap metal recycling company which has all the correct equipments to determine the correct prices of your scrap metals and sell your scrap for decent money. However, it is always good to understand how the scrap metal prices are determined. The market fluctuates daily which affects the prices of commodities. Having a know-how of the commodity market updates, lets you determine how much value should you get for your scrap metal basis which metal category it falls in- iron, copper, or aluminium. If your scrap metal is corrosion free and clean, the scrap metal yard is likely to pay you more than if it is rusted, dirty or tainted. Hence, ensure you clean the scrap metal before taking it to the yard. This section points to the number of scrap metal yards present around your location. If there are more number of scrap metal yards then customers get a fairer price on their scrap metals as many dealers vie to give a good deal. We generate a lot of things that can be recycled, but rather are just dumped. And materials like plastic and metals pollute the surrounding environment. What comes to the rescue? Recycling. The process of recycling is important considering the world we live in. When you recycle materials, you help manage to save energy, resources and avoid waste generation that pollutes the earth. Metals like scrap copper and aluminium, accounts for 8% of overall recycled items. Recycling such materials greatly help in reducing the resource-burden and costs required to produce raw materials. The also reduce the impact caused during production of raw materials like metals, which have a negative impact on the environment. Moreover, recycling industry provides employment on a large scale. Also there is no upper limit on how many times you can recycle, renew and reuse a metal. The practice of recycling scrap metals starts with you. You can recycle redundant metals and earn money instead of throwing them into trash. This practice not only helps people earn money but also protects environment degradation due to harmful metals. If you want to recycle scrap metal, you can get your items directly to our Scrap Metals Qatar facility. We ensure that you get optimal value for your scrap metal and the assurance of environment-friendly recycling processes being undertaken aligned with the standard practices. Metal recycling has played a significant role in filling the gap with regards to availability of precious metals like aluminium, brass, copper, silver and gold. Scrap Metal Recycling has aided in the process of preventing wastage of metals which are rather used as raw materials. This has ultimately fuelled theglobal manufacturing supply chain. Today, you can see various companies working towards recycling every type of metal. Globally, companies recycle an average of 90 million tons of iron and steel, 2 million tons of copper, 5 million tons of aluminium and 2 million tons of stainless steel each year; making it a global phenomenon supporting world economy and trade. This has greatly contributed towards strengthening resource sustainability. Metal scrap recycling is an industry that is profuse in thousands of employees working to convert scrap metals into useful metals, thus making it a significant industry that provides job opportunities. Another big advantage of scrap metal recycling is that the process can be used to work on metals for multiple times without affecting the metal’s original properties. Copper and aluminium are the most recycled metals. Scrap trading professionals buy and sell metals which then reach the recycling plants where it is recycled to derive new raw material that contains original metal properties. Scrap metals like aluminium soda cans, auto parts, and doors, are some typical items recycled on a regular basis to derive useful metals. We are a Scrap metals Doha company, one of the largest scrap metal dealers in Middle East. How To Maximise Value Of Money Received On Aluminium Scrap Recycling? Aluminum is one of the most popular metals known for its lightweight (therefore convenient handling) and non-ferrous quality. Aluminum scrap recycling can get you a tidy profit when you know the various grades of aluminum and sort them out as follows. Radiators- A clean radiator is the one that is devoid of plastic, hoses, steel and tanks unlike a contaminated one giving you less value for your scrap. Sidings- Sidings are present in aluminum objects like downpipes and sinks. They should not be contaminated with items like tar, steel, or Styrofoam. Cast- Usually brittle with a grainy texture inside, cast is used in engine cylinder heads of cars, housing lights and barbeque covers. Aluminium Radiators- They’re available in air conditioners. Cut off the steel flanges if any for better value on scrap. Steel flanges can also be sold as scrap. Extrusions- A clean aluminum extrusion like a window frame is devoid of any kind of plastic, rubber and steel. Aluminum Sheet- It is the lowest grade of aluminium scrap found across all items not mentioned above including pots, pans, and lawn chairs. 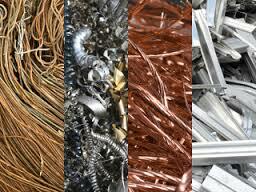 Sort and clean the Aluminum Scrap Recycling items as per the grades above and get best prices for your scrap. What Are The Best Sources Of Copper Scrap? Copper scrap is one of the most demanded metals across various industries and looked upon as the most profitable metal scrap. It’s because copper is widely used across many industries. Mining copper from copper mines requires lot of money. Industrialists, therefore, choose to use copper scrap for various purposes. Let’s see what are the best sources of copper scrap? Copper has a vast presence in terms of components that make most of the home items like light switches, vacuum cleaners, gas and water pipes, pans, awnings and most other items present in your home that are made of metal. The best source of copper scrap is wire which also has a ubiquitous presence in your home from electrical wires to computers to television wires. Automotive components of motors especially from that of old vehicles also give good amount of copper scrap. You get good value for your copper scrap by recycling your Copper Scrap in Dubai. Apart from that the habit of recycling scrap metals instead of dumping them in large dumping grounds prevents accumulation of non-biodegradable wastes. These wastes are harmful for the environment and land, leading to its degradation. How Technology Has Improved The Scrap Metal Industry Transactions? The recycling process of scrap metals has been there since centuries. It can be dated back to the age when people started to melt metals and configure them into newer and sharper tools. Gradually, as technology became more and more advanced so did the process of scrap metal recycling. Now people can buy and sell scrap metal on the go. Let us see how technology plays an important role in streamlining the processes of scrap metal industry. Internet enables people to buy and sell scrap metal easily. 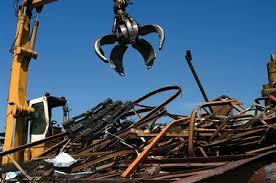 You can go on the website of a scrap metal recycling company and find junk yards nearest to your place. Buyers also get the benefit of low prices thanks to competitive pricing and transparent deals online. (You can even check customer feedback in terms of service, pricing policy and so on.) To prevent customers from making deals with bogus companies, there are sites that display verified scrap metal firms. Technology makes process of communicating with the scrap dealer easier. Now you can directly communicate with the sellers or buyers of scrap metal and evaluate for any possible misconduct. Tip- Ensure you communicate through verified platforms to prevent deceitful transactions. Online inventory management enables Scrap Metal Companies to organize customers’ scrap on the basis of their individual requirements. One of the major benefits of technology for scrap metal services is that companies are getting greater exposure to the market. People come to know about scrap yards easily through email notifications, apps and so on. As a result, this streamlines transactions for scrap metal recycling companies and also makes buying and selling of scrap for customers easier. Technology also gives access to more and more data in no time thus making the process of evaluation based inventory accrual faster than ever. Your car is perhaps one of your most expensive assets. While being a car owner feels good, it also makes you go bonkers at times. If you put your car to daily use, you will have to repair your car at regular intervals. And that can be an expensive matter. We have compiled a list of tips to help you buy the right auto parts helping you save on expenses and further encouraging environment friendly gesture. Used car parts should be attentively bought. There are thousands of auto parts, getting the right nuts-and-bolts require a thorough research. In fact, take the car along with you to ensure the perfect match of the auto part. Before buying your used car part from a scrap metal yard you should do a background check about the Fortune Metals company. Browse the internet for forums, etc. to dig out any negative comments about the company. You would not want to conduct business with any shady scrap metal company. There is risk in purchasing used auto parts. Will they work or not? You cannot anticipate that but you can surely cover the losses if any by ensuring your parts come with a return and exchange policy. This enables you to exchange your auto part in case it does not perform well. Now there are many companies that even offer fake insurance policies. Therefore, ensure you get a policy that is legally binding. Read and understand the contents of the policy before you buy the auto part. Otherwise, you will end up being disappointed not reading the contents of the policy and feeling helpless in the end. Concluding Tip- Always buy an auto part that comes with a warranty. Canisters are really difficult to wave off. You need to know some tips on how to prepare the food and drink canisters for the scrap yard. Rinse the cans thoroughly. The scrap yards wouldn’t want food particles to be see over the metal you are selling. Crushing the cans have become a common behaviour with people. When your done gorging that delicious tuna or sipping the juice, you are most likely to crush the can. Try not crushing them if you are going to take them to the scrap dump. It is because the scrap yards would like to see the cans empty as they are with no litter inside the cans. Categorize the canisters. Start with sorting steel canisters vis a vis aluminium. You can use a magnet to separate aluminium from steel. Collecting canisters is an activity to be executed with care. When you collect cans remember to ensure yourself you know the place thoroughly before collecting the cans. So if you want to collect cans or other scrap metal from a commercial or residential area, be sure to take permission from the concerned authorities and staff. It is important to know that intruding in an area to even collect metal scrap is prohibited. Some scrap dumps may not accept your food canisters as they may have certain limitations. The scrap yard may require the food canisters to be washed properly and or disavow them due to being crushed even slightly. Hence, ensure you follow the above tips to have the scrap yard accept your Aluminium Scrap in Qatar. Winter does not affect you much if you belong to the industry catering to heaters. However, winter does have a significant effect on the scrap arm where the scrap yards and associated employees are seriously affected with lessor no scrap jobs due to snow. How should scrap yards tackle this snowy haul? Here are some useful suggestions. Winter is the best time to prepare for great profits ahead. How? Winter is the time when the huge snow lands make it difficult for scrappers to collect scrap thus affecting steady business flow. Instead, take time to prepare a client list. This includes the various clients you are going to contact and recommend your services after the winter thaw. Throughout the year, you may not have got time to organize your work area. Winter is the time to get everything in place so that you can focus on business as soon as the weather lightens. Put your scrapping instruments ready and brace them up, sharpen them and you are all set to bring in steady business with higher revenues. The busy days often make us neglect the mundane paperwork. Winter is the best time to ensure all your bills are paid and you don’t receive a hugely numbered fine check at your doorstep later. Don’t forget to pay your taxes! While you are busy outdoors at work, you forget to manage the scrap present inside your home. So while you’re enjoying sipping hot chocolate, take time to work on the scrap metal accumulated at your home like breaking down the redundant computers or stripping the aluminium wires. Lucky Group is a renowned company dealing in Ferrous Scrap Dubai services and more.